Talk about meditation dedication! 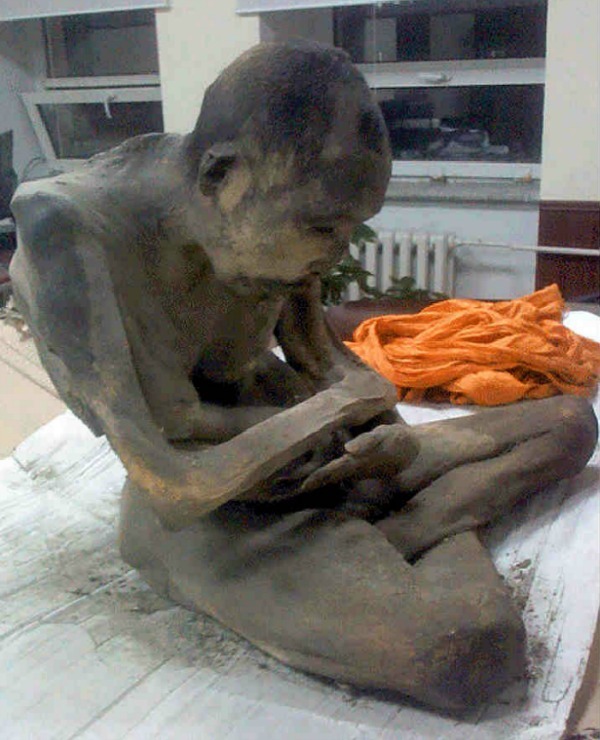 In the province of Songino Khairkhan, Mongolia, the mummified remains of a Mongolian Buddhist monk has been discovered cloaked in a piece of cattle-skin and frozen in an impressive lotus position. Estimated by forensic experts to be about 200 years old, the monk’s perfectly preserved corpse showed no signs of macroscopic decay. Speculation has it that the monk was one of Lama Dashi-Dorzho Itigilov’s teachers. This monk and Lama Itigilov, who died in 1927 with his body also preserved in lotus position, both appear to have followed a version of the Northern Japanese Buddhist tradition of sokushinbutsu, or self-mummification. Sokushinbutsu is a long process, one that spans several years of physical, mental, and spiritual preparation, in order to achieve supreme enlightenment via death. The 'meditating mummy' has since been brought to Mongolian capital Ulaan Bataar for further studies. What better way to go than in complete mindfulness and peace, right?